Castle Comfort Stairlifts offers top brand stairlifts, keen prices and fast installs for all those seeking stairlifts in Swindon, Wiltshire . And all work comes with our no-quibble guarantees and famous customer service satisfaction. Give us a call today on 01179 059 177 If however, you are looking for fascinating facts about the area then feel free to read on. Castle Comfort Stair Lifts welcome you to Swindon, the biggest town in Wiltshire. Today we’re going to take a look around this ‘railway town’ but more of that later. First of all let us tell all visitors and the people of Swindon (Swindonians) themselves what Castle Comfort Stair Lifts can do for you! Well of course we can supply stairlifts for you or for loved ones who need some help getting up and down those stairs. Obviously if using the stairs has become a problem for you whether you’d been injured or through illness, it’s very frustrating. Castle Comfort Stair Lifts are keen to help you might movement a little more bearable. We can advise on the type of stairlift best for you and your home; we supply stairlifts from all UK manufacturers so can give you an unbiased opinion on either straight, curved or perch lifts. Why not give us a call on 01179 059 177 to find out more. Swindon in Wiltshire is just 40 miles from Bristol in the west and Reading in the east and 81 miles west of London. Isambard Kingdom Brunel, the chief engineer for GWR, Great Western Railways, chose Swindon as the location for train works way back in 1840. There is myth around the choice of spot. The legend is that Brunel and Daniel Gooch, another railway engineer, were surveying land north of Swindon Hill and Brunel threw a stone or dropped a sandwich declaring the landing spot as the new site for the railway works! At Swindon GWR opened its railway works and Swindon became a ‘train town’. The first ‘shed’ built was a repair shed, soon followed by locomotive building; the first engine was built in less than two weeks in 1846. A further 6 Iron Dukes – a class of broad gauge locomotives – was built in Swindon. By 1855, the railway works were producing a locomotive a week and employing 2000 men. Goods wagons were also built here. By 1900 it was estimated that the Railway works were employing approximately three quarters of Swindon’s workforce. At the beginning of the 1870’s GWR had started to deduct a small percentage of every employee’s wages to go into a healthcare fund, allowing GWR doctors were able to prescribe workers or their families free medicines. By the end of the decade the fund was able to supply artificial limbs manufactured by craftsmen in the ‘carriage and wagon works’; nine years after this, a dental surgery was opened obviously much needed as in the first few months the dentist extracted more than 2,000 teeth. The doctors could also prescribe haircuts or a bath! The services which GWR put in place were later used as the blueprint for the National Health Service. Swindon station opened as a Junction Station where the Great Western Line divided to head to Gloucester, which meant that every train passing through stopped for a minimum of 10 minutes at Swindon. This was an opportunity to open a place for refreshments on the station – the first of its kind. Locomotive building concluded at the Railway Works in 1965 and closure took place in 1986; some of the offices and works have found new uses: the offices of English Heritage and new storage buildings for National Monuments Record. Though we can’t build locomotives and we won’t make you feel like a heritage piece! Give us a call on 01179 059 177 and we’ll get you moving again. 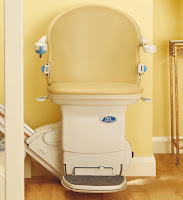 Talk to us about what you think you need; we can assess your home and help you choose the right stairlift for you. Even better we can have it installed in your home before you’ve had time to reach the stairs! In most cases installation takes about an hour and at the most half a day. There’s a football presence in the town. Swindon Town FC has been part of the Football League joining the third division back in the 1920’s. Over the decades they have yoyo-ed up and down the divisions and currently stand in npower League 2. Swindon Town FC are nicknamed the Robins. John Trollope who played for the club and then managed them; John Moncur Who played for Tottenham Hotspurs, Swindon Town and West Ham during his career; Duncan Shearer brother of David who played for Chelsea and Swindon Town; Norwegian footballer Jan Åge Fjørtoft who played for Swindon Town in the early 90’s and is well remembered playing for Norway against England for running round the pitch with arms stretched out like an aeroplane! Glenn Hoddle who played for Tottenham Hotspur and Swindon Town during his footballing career also managed Swindon Town FC between 1991 – 93 taking them into the Premier League. Castle Comfort Stair Lifts hope you’ve enjoyed our brief tour of Swindon. Remember to checkout our founder Keith’s short video if you or a loved one looking for a stairlift. Also remember to look at our stairlift comparisons of makes and what they do and importantly how much they cost. Then give us a call ( 01179 059 177) to see how we can help or advise on financing your stairlift either with a 0% option or a grant.